8 KTM 200 Duke India launch by early 2012. Plans of a 350 Duke as well..!! Official word about the KTM 200 Duke launch date in India.. I hate to spread useless speculations without the backing of some solid info. This time economictimes carries the news of the launch date of the KTM 200 Duke in India. According to the news, KTM CEO Stefan Pierer has revealed plans of the launch of the KTM Street bike (Yeah..it's NOT an offroader), the 200 Duke in India in the 2012 Auto Expo in New Delhi..!! Interestingly Mr. Pierer also revealed plans of a 350 cc KTM model for India to be launched a year later (probably by 2013). It's almost certain the the KTM 200 Duke would look the the KTM 125 Duke, which Bajaj manufactures for KTM and exports to Europe (exports started just a couple of months back). Indian bikers can rejoice as the "Baby" Duke slated for India will have a more powerful 200 cc engine instead of the 125 cc for europe. It's not clear if the next 350 cc model will share the looks of the 125/200 Duke or will be an entirely new model. Anyway, the 350 cc KTM would definitely be out of my budget. Engine/Power specs and pricing have not been revealed yet. But just from the fact that the 125 cc Duke can belt out 15 Ps of max power, I am expecting at least 22-23 Ps of power from the 200 Duke (provided it's not detuned too much for India). 22-23 Ps of power coupled with a light weight kerb weight of around 130 kgs would mean that the KTM 200 Duke would have a healthy "power-to-weight" ratio (to easily take on bikes like the Honda CBR250R) and will be an absolute fun machine. Being an European brand and having much more exotic parts on it, the 200 Duke would "probably" be priced at a slight premium over the Honda CBR250R. Hopefully the 200 Duke should be within Rs. 1.5-2.0 lakhs.. which would be the maximum that I would be able to stretch for a bike right now. Austrian sports bike maker KTM today said it will launch its first motorcycle, jointly developed with Bajaj Auto Ltd , in India at the Auto Expo to be held in the capital early next year. The company, in which Bajaj Auto holds nearly a 40 per cent stake, had already launched its first co-developed bike in Europe in March this year. "During the Delhi Auto Expo next year, we will be launching the first 200-cc Duke bike in India," Cross Industries AG CEO and also the CEO of KTM Sportmotorcycle AG , Stefan Pierer, told reporters here. The bike will be produced at the Pune facility of Bajaj Auto, he added. When asked about the company's sales target in India, Pierer said: "We expect to sell 25,000 to 30,000 units in India in the first year of launch. After one year, we will launch the 350-cc Duke in India." KTM had launched the 125-cc 'Duke', developed jointly with Bajaj Auto, in Europe in March this year. "We have already sold nearly 7,000 units in Europe. We are targeting to sell about 10,000 units in Europe this year," he said. The two partners are looking to expand the markets for their bikes. "All the bikes that we produce in India will be global models. Now we are looking to export KTM bikes from Bajaj facility to other emerging markets like Thailand, Malaysia, and Brazil," Pierer said. Overall, KTM aims to sell 82,000 units this year, up from 62,000 units in 2010, he said, adding that by 2015, it was targeting the sale of 2 lakh units. In 2007, Bajaj picked up a 14.9 per cent stake in KTM for around Rs 300 crore. A year later, it increased its stake in the European bike-maker to 25 per cent and has been increasing it gradually. So by early 2012 I can expect the KTM 200 Duke in my garage..!! Sweet..!! 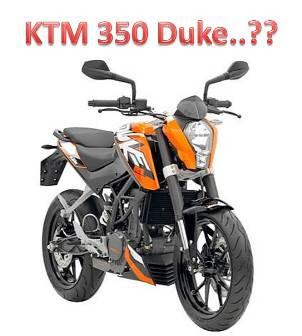 launching date for 350 duke 20013???? Got it edited man... thanks for pointing it out. Darn these sticky keyboard keys..!! "We plan to launch a new Pulsar with cosmetic changes in August this year. We intend to bring in a brand new Pulsar by the last quarter of this financial year"